The Love & Respect Ministry Team and pastor-translators traveled together to the Malindi Hospital just in time for visiting hours. Our ministry time there was intended to be a practical application of becoming acclimated to both translation and being translated for while serving the Lord by praying for the sick. I was assigned to the men’s ward and went with Pr Karisa, who has translated for me in the past and who serves as a mentor to me and many pastors in the Watamu Pastors’ Fellowship. There we found three men handcuffed to their beds only to learn they were prisoners from the Malindi Prison. 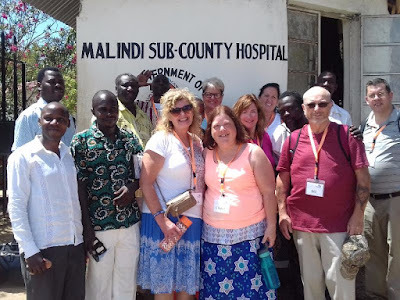 I found this to be a Divine connection as the following Sunday I would be serving with a few team members in the Malindi Prison and have a connection to the chaplain there. Speaking the chaplain’s name gave the prisoner-patients confidence in us as more than strangers. We spent our visiting hour with these three men and believe that God is bringing a special kind of healing to their lives. Team Members and pastors, you are welcome to add your experiences to the post as I could not be in all places at all times.